ARoglyph assists travelers with relevant on-site information from locals or from other travelers who are already familiar with the place of interest. ARoglyph gives neighbors a way to discuss topics of common interests without face to face meetings and without knowing each other in person. ARoglyph helps introverts and people with disabilities in socializing by means of a “delayed conversation” which is not addressed to anyone in particular, nor requires making friends with people before reaching them. ARoglyph can help retailers to expose their offerings to people around and replace posters and other ATL advertisements with virtual marks containing pictures, prices, descriptions etc. ARoglyph can help city communities and other institutions to mark important places such as bus stops or tourist locations and make them visible in the virtual space thus making city navigation easier. Can you imagine that the virtual mark is visible within a limited distance only, from 20 up to 1000 m! 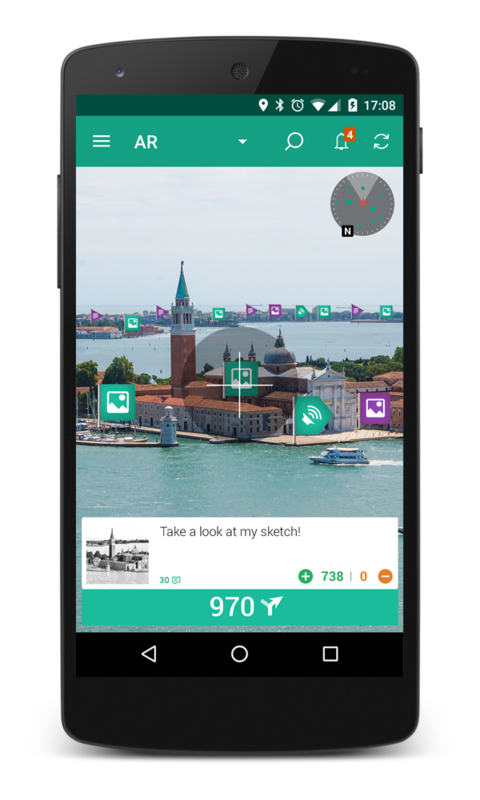 And it can be viewed not only on the map, but as augmented reality through the camera of your smartphone.